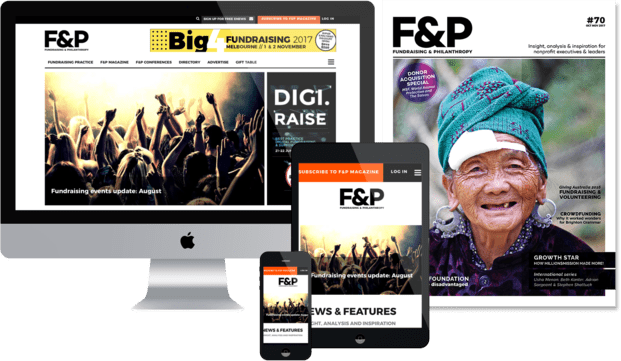 Need to Revolutionise your fundraising? Grow your organisation and fundraising with masterclasses or personalised sessions from visiting UK expert Alan Clayton, founder and creative director of Revolutionise. The agency, formerly Clayton Burnett, is now delivering services in Australia through a partnership with Robejohn, reveals Liz Henderson. The renowned UK fundraising agency Clayton Burnett has re-badged as Revolutionise and announced the launch of international consulting services through partnerships with agencies in seven countries including Australia. The Australian partners of Revolutionise are Kathy John, managing partner of Melbourne-based fundraising consultancy Robejohn, and Robejohn’s senior partner Leo Orland. The move will put additional international expertise in the hands of Australian nonprofits along with a whole-of-organisation approach to growing fundraising. Both are being delivered by Revolutionise with the aim of sharing expertise across borders to change and grow nonprofit capacity in leadership, fundraising and donor-centricity through unity of purpose and emotional alignment. Through the partnership between Revolutionise and Robejohn, Alan Clayton is now in Australia to give “Emotional Fundraising Down Under” masterclasses. The masterclasses are a two-day immersion to discover a unique emotional proposition for marketing and fundraising, helping you position your organisation and motivate your constituents. Nonprofit organisations can also arrange ‘bespoke days’ where chair, board or council, CEO, marketing, communications, fundraising and programs people come together for one day to work to the organisation’s specific brief. More than 10 organisations have booked their bespoke days throughout June, July and August. Some are planning capital or major gift appeals, and some public appeals, while others want to inspire new motivation and culture change in their organisation from the top down.